I hired Linda Burkhardt after spending many countless hours researching design publications and meeting with numerous architects and designers. No one was right for the project until i met Linda, who was perfect for the job. I was looking for someone like Linda who wasn't afraid of going in a attic or walking in a basement and then discussing and designing my dream home. 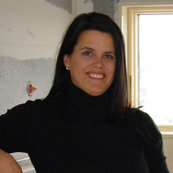 The idea that Linda is a contractor and a kitchen/bath designer was exactly what i was looking for! She has an amazing ability to see where a wall should be moved and where to add windows and make your kitchen and baths and any room in the house the WOW factor. Her team of people are excellent and I am extremely picky, they are complete professionals! I bought a small home in East Hampton that had not been redone since the 50s. Most of the house including a brand new kitchen and baths was renovated down to the studs. We added all new electrical, heating, lighting, windows, floors, tile, doors basically everything! Linda and her team are excellent, Linda is not afraid of hard work and many emails back and forth and numerous meetings. She will do whatever it takes to make a client happy. It took over 8 months to make my dream home and It is perfect! Below is my before/after of my amazing kitchen. I would recommend Linda and her team to anyone in the area who is doing a remodel.